Albion stars Glenn Murray and Bruno set a new Premier League record on Saturday when they combined for the Seagulls' goal against Wolverhampton Wanderers. 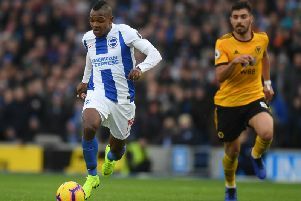 Bruno's shot was turned home at the back post by Murray - his 100th goal for Brighton - and it saw them set a new Premier League record as the oldest pair to combine for a goal in the competition. With Murray aged 35 years and 32 days and Bruno 38 years and 25 days, their combined age is 73 years and 57 days. They beat the combined record of 72 years and 168 days when Paul Scholes (35y 273d) set up Ryan Giggs (36y 260d) to score for Manchester United against Newcastle in August, 2010. The Manchester United legends had taken the record from Portsmouth's Tim Sherwood and Teddy Sheringham, who netted against Charlton in October, 2003. Their combined age was 72 years 59 days. Sheringham is also in fourth place in the list after setting up Les Ferdinand to score for Tottenham against Southampton in August 2002, with their combined age 72 years 51 days. In fifth place are Alex Rae and Denis Irwin, who combined to score for Wolves against Leicester in October, 2003. Their combined age was 72 years 18 days.